Happy St George's Day to all my readers! There is nothing happy about the shame Britain should be feeling at Clegg's performance last night. Doesn't he know that Poland is in deep shock and national mourning at the loss of their President and many other top people from their country's government? How can he lay about these peoples' reputations calling them 'homophobes, anti-Semitic and racists'? Poland is a deeply traditional Catholic country which doesn't need any morality lessons from a young political upstart who knows nothing about diplomacy and how to correctly deal with relations to other European countries. Poles are angry at Clegg's idiotic comments. who the hell does Nick Clegg think he is?. 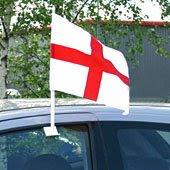 I didn't even know it was St. George's day today. The media have certainly kept pretty quiet. We often hear accusations that our ruling elite, multiculturalists, and Europhiles are desperate to suppress Englishness. It would appear they are doing rather well if this is their objective. What on earth are you doing posting at quarter to five in the morning, when all good girls should be tucked up in bed ? "in order to assist other motorists to identify potentially dangerous drivers, it is now compulsory for anyone with a lower than average driving ability to display a warning flag. The flag (comprising of a red cross on a white background) will be attached to the top of at least one door of their vehicle. For those drivers of exceptionally low ability, additional flags are required. Please take care, and avoiding action, when meeting one of these vehicles." I believe he actually referred to them as "nutters". It was a disgraceful outburst. I agree with Ann Leslie - the Lib Dems are the real nasty party. I see Ivorbiggun the environmentalist is recycling his annual joke. A pity the process doesn't remove the underlying bigotry. Salmondnet old chap, the old 'uns are the best 'uns, are they not? Today is St George’s day and the day that the BNP have chosen to launch their election manifesto in my home town. It is an event that I find extremely galling for all sorts of reasons. But it allows me to return to a theme, which I have raised before and that is the expropriation of emblems by the far right. And as it is England’s patron saints day it is an opportunity to essay this phenomenon. I am fortunate enough to live in Leek in Staffs where over recent years some effort has gone into marking the day This year will be no exception when someone dressed in armour will be paraded around the market place. There will be market stalls, music and entertainment. If this year goes like last year then the town will be festive and crowded. And all credit to the volunteers who co-ordinate the event and participate in what is essentially a fun event. It really does annoy me, as I have said, that we have allowed the far right to expropriate the flag and an event to celebrate the many positive things that England and Britain have bought to the world is the perfect repartee. I tried to express some of these comments at a conference held at Staffs University on combating the far right last year. The response to my comments was depressing and predictable. Sadly, some people on the left just don't get it. I made my comments because someone at the conference referred to symbols such as flags. She added that "the BNP have their flags of St George and the Union Jack and that we should have ours" Helpfully she suggested a pink flag. But how have we allowed a situation where we have abandoned the national flag and handed it over to the far right? Mr.Clegg condemed political PARTIES that are homophobic racist and anti-semitic. The British National Front does not represent the views of all the British people because it waves the national flag.